Gert showed us a city level experience generated by ArcGIS for 3D Cities – a solution template from a database schema. The Portland Web Scenes from this model showed analytics such as zoning volumes, air pollution and road hazard analysis that linked to traffic cameras, which is great information for city council regulation planning and community consultation. At 10.2, CityEngine capabilities can be accessed directly from ArcGIS through a new geoprocessing tool, making procedurally generated 3D content readily available for all ArcGIS 3D Analyst users. You can easily create your own 3D content in ArcGIS Desktop using pre-authored content with ‘Features From CityEngine Rules (3D Analyst)’. In this scenario, CityEngine is the back-end and the input rule is a CityEngine rule package (.rpk) that generates 3D geometries from existing 2D and 3D input features. Procedurally generating 3D content allows you to get the most out of your GIS data by leveraging both the feature’s geometry and its attributes. Simple procedures include extruding building footprints by a ‘height’ attribute, while complex procedures are available through the back-end of CityEngine, where you can write a procedural rule that can – for example – convert a building footprint into a maximum structure that would still conform to the city’s zoning laws. Procedural content is especially effective for iterative design-and-analyse geodesign workflows, where you can simply change a few parameters and quickly regenerate an updated design. Layer types currently supported in ArcScene include feature layers such as point, line, polygon and multipatch geometries, layer extrusion or 3D symbology, rasters and TIN, with line support for streets, coming soon. The City Engine Toolset also offers users the powerful sharing capability of Web Scenes with ‘Export To 3D Web Scene (3D Analyst)’ to export ArcScene documents (.sxd) and CityEngine Web Scene (.3ws) format and display them in the CityEngine Web Viewer in browsers that support WebGL. Making 3D information public or sharing the easy-to-use interface with internal departments is a clear benefit to end users. You can find many examples of City Engine Web Scenes on arcgis.com. I wanted to applaud Gert mid-presentation when he started outlining the future technology offerings in this space. CityEngine is not only expanding functionality, but also taking the hard work out of writing rules by providing a library of regional, standard and more complex rules vavailable in a marketplace that is sure to energise the sharing of preconfigured content. Basemaps and labelling will orientate the visualisation. The ability to stream larger scenes will be great for expanding cities and network analysis to connect people to places within the model. You will even be able to see your 3D models on your mobile devices. All these exciting new developments will be outlined in a future White Paper to keep you informed. 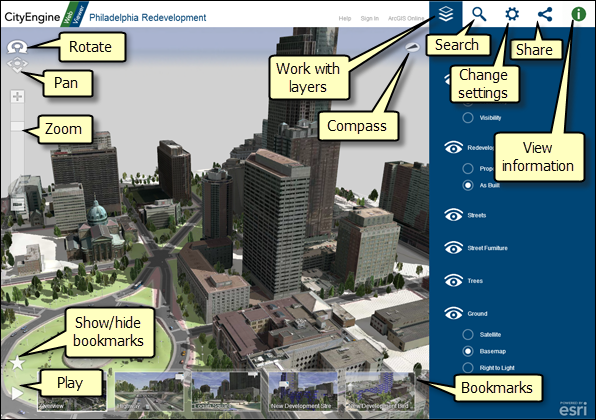 Esri’s CityEngine will continue to enrich the user experience, encourage user participation and offer integration to view 3D anywhere. Joy! This entry was posted in Events, Ozri and tagged 3D, CityEngine, Gert van Maren, Ozri, Ozri 2013 on September 11, 2013 by Dagmar P.
The presentation was really impressive.I have tried to use this tool but could not find the .rpk file in the location where it used to be. Can anyone help me to find the rule package used in that presentation. thanks. Please check the resource center at http://resources.arcgis.com/en/communities/city-engine/ The rule package will be published there in the near future.